Like labor markets that include employed and unemployed persons, real estate markets include rented and vacant properties available for rent. Owners and managers of rental properties generally keep an inventory of vacant properties that can be rented on short notice. Because this practice is costly, finding optimal levels of vacant inventories is essential. Texas has a large rental housing market. 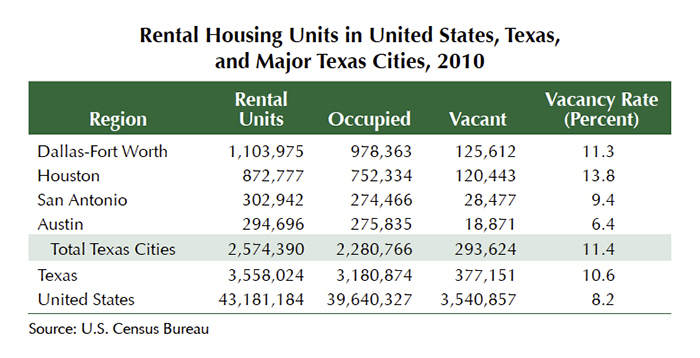 With more than 3.5 million units, Texas accounted for about 8.2 percent of the U.S. rental housing market of more than 43 million in 2010 (see table). More than 2.5 million of the state's multifamily residential units are in Dallas-Fort Worth, Houston, San Antonio and Austin. Dallas-Fort Worth had more than 1.1 million multifamily residential units in 2010 followed by Houston (872,777 units), San Antonio (302,943 units) and Austin (294,696 units). The state's total rental housing inventory comprises rented and vacant units available for rent (see table). The vacancy rate is the number of vacant rental housing units divided by the total number of rental housing units, which varies from a high of 13.8 percent in Houston to as low as 6.4 percent in Austin. The vacancy rate tends to increase when the supply of rental units grows faster than demand. The vacancy rate is an indicator of the flexibility of the supply side of the rental housing markets. In 2010, the vacancy rate in the Texas rental housing market was 10.6 percent compared with 8.2 percent for the United States, which shows that the supply side of Texas' rental housing market was more flexible and robust than the nation's rental markets. The concept of natural vacancy rate is closely related to the concept of nonaccelerating inflation rate of unemployment (NAIRU). According to renowned economist Milton Friedman's NAIRU, there is a level of unemployment rate that tends neither to raise nor lower the wage rate or inflation rate. According to NAIRU, wage and inflation rates are determined by the difference between the actual level of unemployment rate and NAIRU rather than the unemployment rate. Applying the concept to real estate markets, there are natural vacancy rates in rental real estate markets, such as apartments and offices, at which the growth rates of rents are zero. Rents tend to increase (decrease) when actual vacancy rates fall below (rise above) the natural vacancy rates. 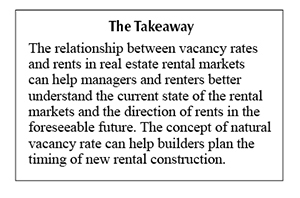 The concept and the measure of natural vacancy rate is important for owners and managers as well as renters in rental housing markets. When the vacancy rate in a local housing market is getting close to the natural vacancy rate in that market, it is a signal to developers to build more units or to increase rents. For renters, vacancy rates lower than natural vacancy rates signal higher rents in the foreseeable future. Monitoring vacancy rates and comparing them to natural vacancy rates can help city planners optimize the effectiveness of a local community's land-use patterns and infrastructure. Data needed for estimating the natural vacancy rate in a local rental housing market consist of the time series of vacancy rates and rents in the local market. For estimating natural vacancy rates in the Texas rental housing markets, the Real Estate Center compiled available time series of rents and vacancy rates for the state's major cities. 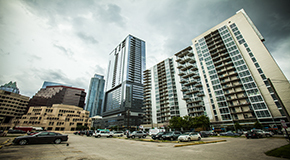 This research project used the quarterly time series of rents and vacancy rates for apartment markets in Dallas-Fort Worth, Houston, San Antonio and Austin from third quarter 2002 to fourth quarter 2014. ​​All four Texas rental housing markets recorded upward trends in vacancy rates in the Great Recession (GR) of 2007–09 (Figures 1–4). 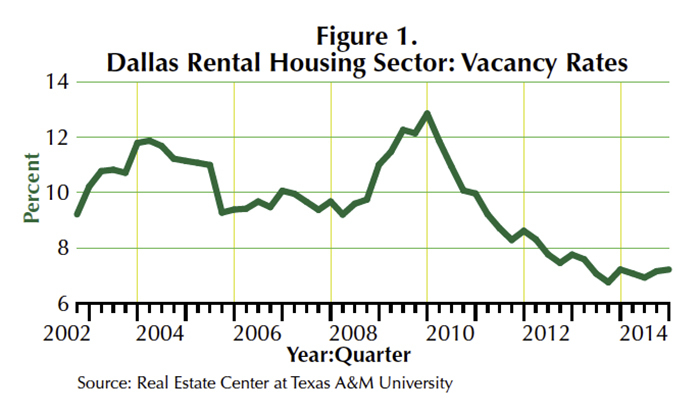 Dallas-Fort Worth's vacancy rates that were moving at around 10 percent before the GR increased to 12.9 percent in fourth quarter 2009, trended downward as the local economy recovered from the GR, and fell to less than 8 percent in 2014 (Figure 1). 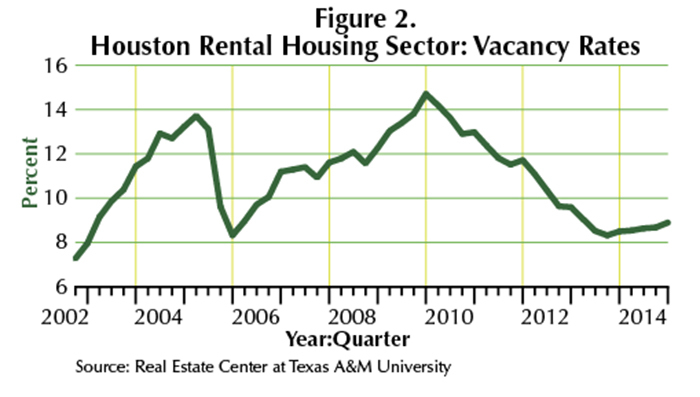 Houston's vacancy rates trended upward from late 2005 and reached 14.7 percent in fourth quarter 2009, then trended downward, falling to less than 10 percent in 2014. 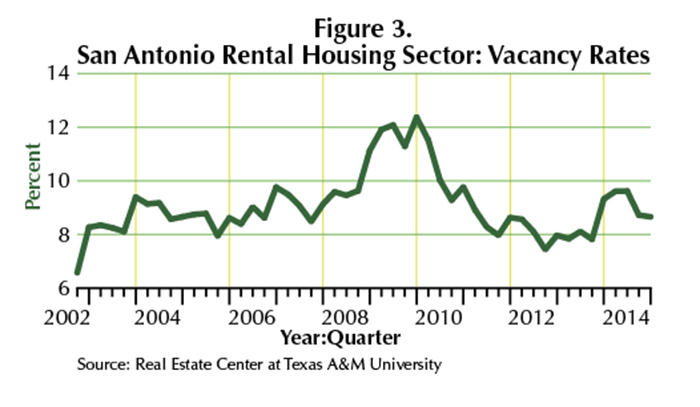 San Antonio's rental housing market had its highest vacancy rate of 12.4 percent in fourth quarter 2009. Austin's vacancy rate climbed to 13.3 percent in second quarter 2009 and since then has been trending downward, falling to less than 8 percent in 2014. These changes in vacancy rates are reflected in corresponding rents and growth rates of rents (Figures 5–9). 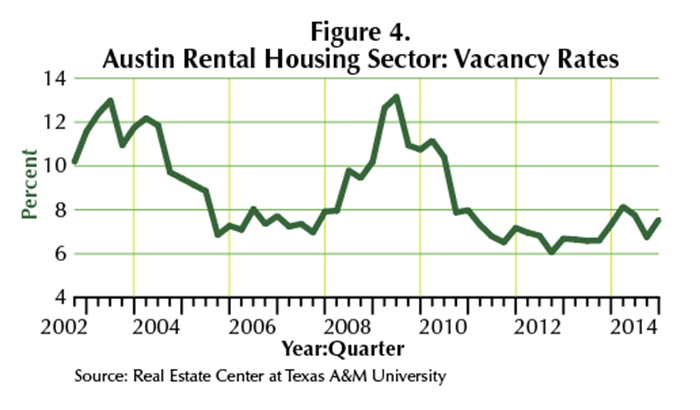 Rental housing markets with lower vacancy rates like Austin experienced higher growth rates of rents. 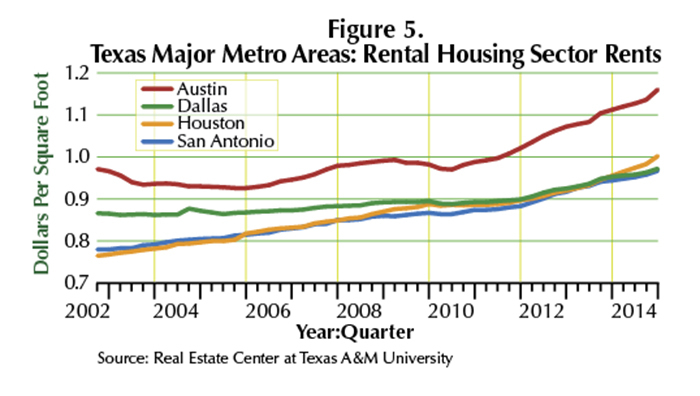 Rent levels in Austin were well above corresponding rents in other Texas cities (Figure 5). The average rent per square foot per month for Austin during the data period was $1 compared with 90 cents for Dallas-Fort Worth, 87 cents for Houston and 86 cents for San Antonio. 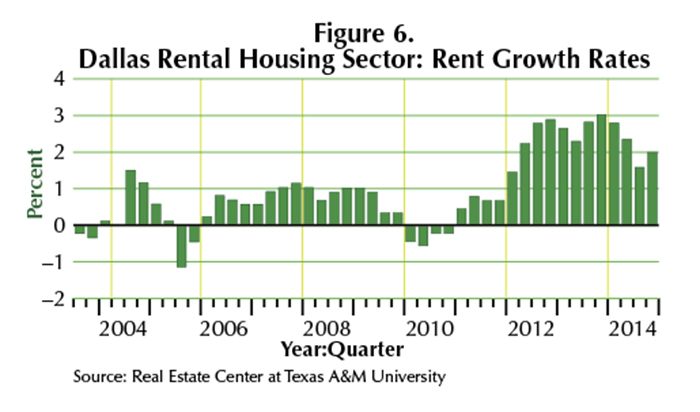 Annual growth rates of rents show Dallas with four quarters of declining rents in the GR (Figure 6). 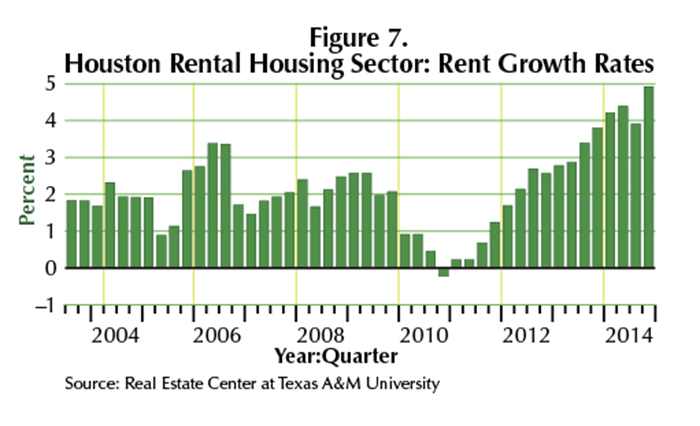 Rent growth rates in Houston's rental housing sector were trending downward in the GR, and since 2010 have been trending upward (Figure 7). 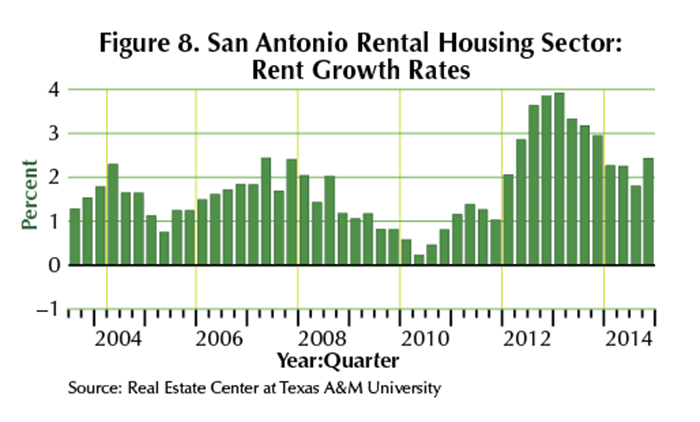 San Antonio's rental housing market has not had a rate decline since 2003 (Figure 8). 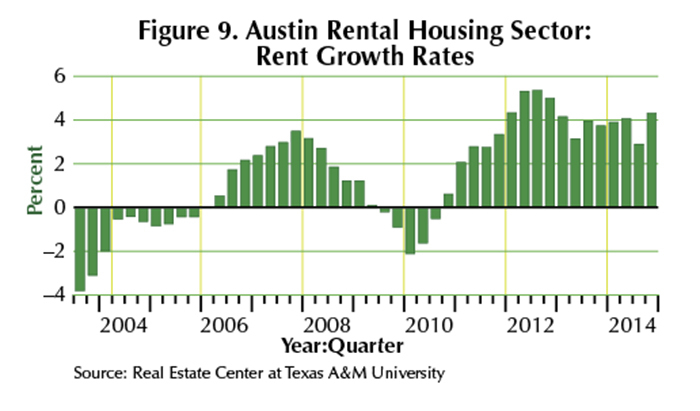 Austin's rental housing market had five quarters of negative growth rates in the GR, and since 2011 has posted annual growth rates as high as 5.4 percent in third quarter 2012 (Figure 9). The simplest way to estimate natural vacancy rates is to bring together time series of vacancy rates and growth rates of rents, then plot a scatter diagram and fit a line of the relationship between the two variables. The point of the intersection of the fitted line and the zero line is the estimated natural vacancy rate. 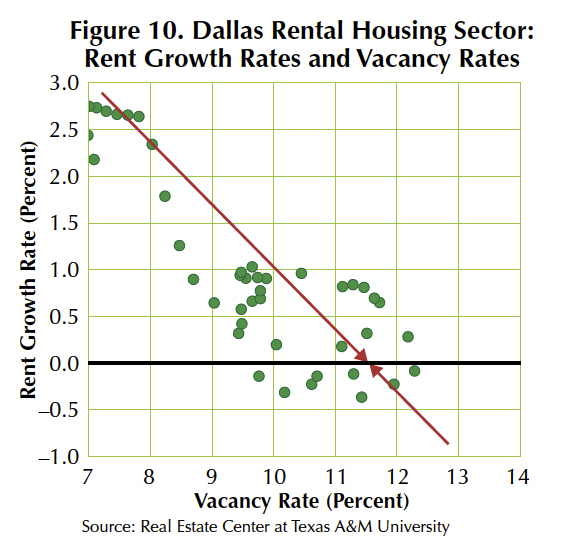 Figure 10 shows moving averages of annual growth rates of Dallas rents on the vertical axis and their corresponding vacancy rates on the horizontal axis. A fitted line of the relationship between the two variables was estimated using regression analysis. As the figure shows, the lower the vacancy rate, the higher the growth rate of rents. The fitted line crosses the zero line between vacancy rates of 11 and 12 percent. The growth rate of rent in this market is zero at the point of the intersection of the zero line and the fitted line. A more exact estimated relationship from the regression analysis shows that the natural vacancy rate for Dallas during the period was 11.5 percent. Rent growth rates in Dallas were positive (negative) when actual vacancy rates were smaller (larger) than the natural vacancy rate of 11.5 percent (Figure 10). Similar analyses for Houston, San Antonio and Austin show natural vacancy rates of 14, 11.2, and 10 percent, respectively. Dr. Anari (m-anari@tamu.edu) and Dr. Hunt (hhunt@tamu.edu) is a research economist with the Real Estate Center at Texas A&M University.